So this Saturday is Ardbeg day. There's quite a bit happening across the Embassies, the Whiski Rooms in Edinburgh will be doing a special tasting of the special release malt to mark this occasion and other events are planned. 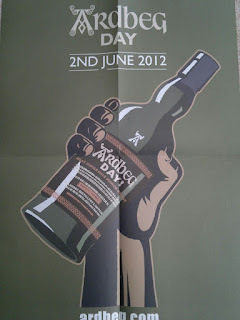 More interesting is the email I've just received about an Ardbeg themed games event in Edinburgh on Saturday will feature lots of goodies and prizes. Not heard yet whether I've managed to grab one of the limited places but wait and see. The main interest is the special bottling. A limited number will be available online and by all accounts this might be the best option for any of us hoping to grab a bottle, sadly just in the UK.